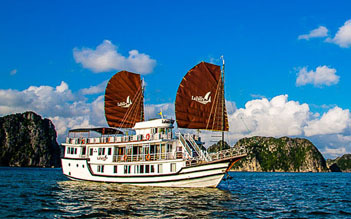 Journeys are uniquely designed for those who have limited time to Halong bay but delight in the thrill of exploration while indulging mind and body in the ambiance of relaxed elegance aboard the region’s funny day-ship. 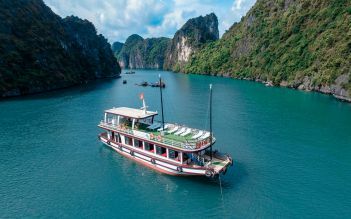 WeGo Halong Cruises will bring you to visit beautiful destinations in Halong Bay including Titop island and Sung Sot Cave. 13:30 Arrive Sung Sot cave means Surprised Cave or Amazing Cave is on Bo Hon Island and is one of the most spectacular and largest grottoes of Ha Long Bay. The mouth of the grotto is reached by ascending about a hundred stone steps. - Visit Titov Island where you enjoy swimming on sandy beach adjacent to the towering limestone mountain with excellence backdrop of the Bay, and climb up Titov Peak for a panoramic view of the bay like heaven paradise. 16:30 - Return onboard, cruise back toward Tuan Chau harbor. There are a lot of time for sunbathing on upper deck with music, enjoy great fun of group touring fellows among world iconic natural scenery. 21:30 - Drop off at your hotel/ stay, trip ends. I booked this one-day trip to Halong Bay from my hotel. It turned out to be the best trip of my holiday in Vietnam. Some people said, the journey to Halong bay is long, but it's OK for me because there was so much too see: the countryside, smaller town and the scenery right before reaching Halong bay port was amazing. The view of Halong Bay from the top deck is more amazing many many times. It's worthed the money and it's the highlight you can't miss in Vietnam. 5 hours seemed short, there were many activities and things to do. Amazing cave is good, kayaking is my favorite one, the view from the peak of titop island is incredible, sitting on the top deck to see Halong Bay is relaxing. The overall trip was smooth and great. And I especially thanked to the great guide, Phuong who made the trip more fun and memorable. She is one of the best guide I met in Vietnam and a great friend during the trip. She made sure everything is fine during the trip. Conclusion: great journey, great staff, great activities and great guide. That's what I got from the trip by paying affordable sum of money. I will recommend this company. Ivan, our tour guide speaks very well in English. He is very approachable and knowledge. The trip itineraries include lunch on cruise, stopover at Sungsot Cave. It is very explorable and manageable. 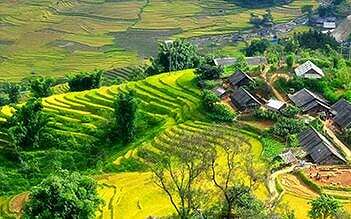 The trip destination is the kayaking trip at the floating village, Luon. The trip between caves and tunnel was surprisingly rewarding. The last destination is Tip Top Beach. The beach is a paradise for swimmers. I highly recommend Wego to any travelers because of its hospitality and friendliness. Ask for Ivan, he is humorous and tourist friendly. He deserves six stars for his service. 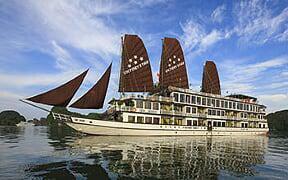 We took the 1-day Halong Cruise with Wego as we did not have enough time for the overnight stay. Initially we were worried we'd lose out on some aspects but after this tour, we were delighted. The drive is roughly 3.5 hours each way but the bus is well air conditioned and comfortable. Our guide, Song, was very interactive and talkative, making the drive seem much shorter. Once we arrived we were brought onto the boat and given lunch, which was great. Our activities included kayaking/row boating, cave tours and swimming/hiking on the different islands. This tour manages to squeeze in everything we wanted to do in Halong. Our guide, Song, was excellent. Always trying to get you involved in the tours, very interested in speaking with us and teaching us about the different aspects of life in Vietnam. Would definitely recommend this tour, great quality of activities, great tour guide and we got to see and do everything we hoped to. The bus picked up us from the hotel in the morning 8 A.M. It is quite a new bus, better than I expected. with an awesome English speaking guide (Ms.Phuong). She is friendly, entertaining and always take care all of us. 3.30 hours in the bus then we arrive the marina. 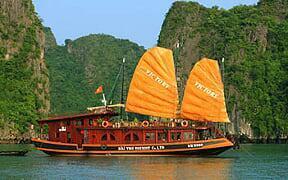 Take a double deck cruise around Halong Bay. 1. The Amazing Cave 2. Kayaking or take a bamboo boat around the fisherman's village (but I have not see any fisherman) 3. Swimming or trekking to the top of mountain. It is quite hot and sunny. Don't forget to prepare your sunglasses, umbrella, sunblock lotion, etc. Halong Bay is the beautiful place and you should not missed when visiting Hanoi, Vietnam.